[NB: I guess you might call this a companion piece to my February post, ‘Why I Write…’]. The immediate & obvious answer, as with most things in life, is ‘What else would I bloody do…? !‘ But I have to admit, I’m an autodidact – always have been, always will be, ever since childhood – which unfortunately made organized education increasingly intolerable** the older I got. However, when it comes to investing, the odds are stacked in my favour – organized education doesn’t offer you a hope in hell of becoming a good, let alone a great, investor. As people often notice with regard to MBAs… [Again, I can’t resist this classic!]. 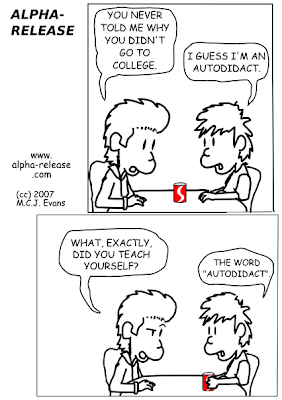 [** Hopefully, that all changes with the advent of MOOCs, which have the potential to offer interactive autodidactism. But don’t believe all the hype – sadly, most people just aren’t motivated enough to learn & study alone. In fact, they often have different priorities… Of course, if you’re dirt-poor & living in a third world slum, you may be incredibly motivated – I think MOOCs present an amazing business/investment (& charitable) opportunity to bring Western education to emerging & frontier markets. Forget the hollowed-out state of manufacturing…the next generation of US college kids, plus their six-figure student loans, should be bloody terrified of the rest of the world potentially competing on far more equal terms…and far less pay]. Buffett perhaps said it best, as he often does: ‘But ultimately, the key to success is emotional stability. You don’t need a high IQ to get rich‘. He was highlighting EQ, rather than IQ, but also implicit in the quote is that education (at least in the traditional sense) isn’t required to get rich either – this is particularly true when it comes to investing. I scarcely need to argue the point – simply give me a couple of books, and a day or two of your time, and that’s really all that’s needed to teach you the essentials of investing. Seriously..!